Please note that the content of this book primarily consists of articles available from Wikipedia or other free sources online. 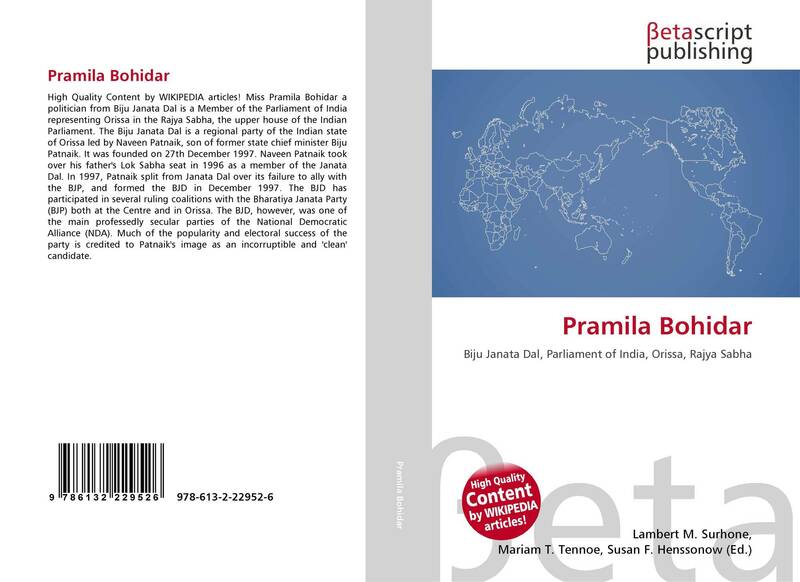 Miss Pramila Bohidar a politician from Biju Janata Dal is a Member of the Parliament of India representing Orissa in the Rajya Sabha, the upper house of the Indian Parliament. The Biju Janata Dal is a regional party of the Indian state of Orissa led by Naveen Patnaik, son of former state chief minister Biju Patnaik. It was founded on 27th December 1997. Naveen Patnaik took over his father's Lok Sabha seat in 1996 as a member of the Janata Dal. In 1997, Patnaik split from Janata Dal over its failure to ally with the BJP, and formed the BJD in December 1997. The BJD has participated in several ruling coalitions with the Bharatiya Janata Party (BJP) both at the Centre and in Orissa. The BJD, however, was one of the main professedly secular parties of the National Democratic Alliance (NDA). Much of the popularity and electoral success of the party is credited to Patnaik's image as an incorruptible and 'clean' candidate.